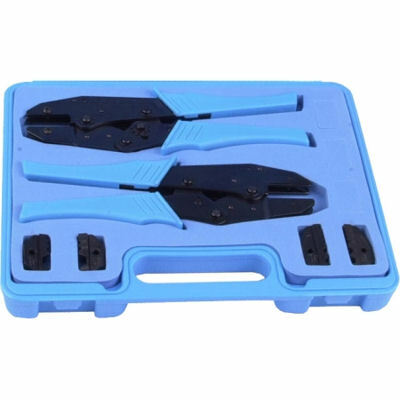 RF Industries cable crimp tool kit allows you to terminate most coaxial and datacom connectors for RG58, RG59, Proflex, RG8, and RG214 among other cables. The crimp tool kit includes two cable crimper along with two die set. Die set one crimps to the following sizes: square 0.052 inch and hex 0.068, 0.100, 0.213, and 0.255 inches. Die set two crimps to the following sizes: hex 0.100, 0.128, and 0.429 inches. The ergonomically-designed crimping tool will last over 50,000 crimp cycles. A handy chart inside the lid indicates which interchangeable die is correct for the particular cable you’re working with. Dies are precision die cast to provide long field service use and are easily changed. Product Narrative Your complete RFI cable preparation and crimping system allows you to terminate most coaxial and datacom connectors for RG 174, 58, 59, 8281, RG8, and fiber optic cables. Ergonomically designed tool will last over 50,000 crimp cycles. Handy chart inside lid indicates which of the four the interchangeable dies are correct for the particular cable. All Hex Dies are precision die cast, not pressed, powdered metal, to provide long field service use and are easily changed using either a Phillips or Standard screwdriver. Crimp Size (1) SQ: .052", Hex: .068, .100, .213, .255"; (2) Hex: .100, .128, .429"